Deciding whether to accept a job offer is a big decision in your life. You need to think beyond the obvious considerations to make the most informed choice. Here is some advice on how you can make the best decision with confidence. You’ve gotten the job offer that you’ve been working so hard to get. That’s great! Maybe you have several job offers to pick from. Even better. You may be feeling a range of emotions as you read over the job offer: excitement, happiness and maybe even relief that the process is over. You’re starting to see yourself in your new role and showing up for your first day at work. You know the details of the offer: salary, benefits and maybe the bonus structure. You have a good understanding of the job requirements. You’ve met your potential new boss, maybe some team members, or your future business partners. Yet as excited as you are, you’re probably feeling nervous about making this decision. After all, this IS a big decision. The IT job market is picking up, especially for IT leadership roles. I’m currently seeing IT leaders evaluating 2 or 3 job opportunities. 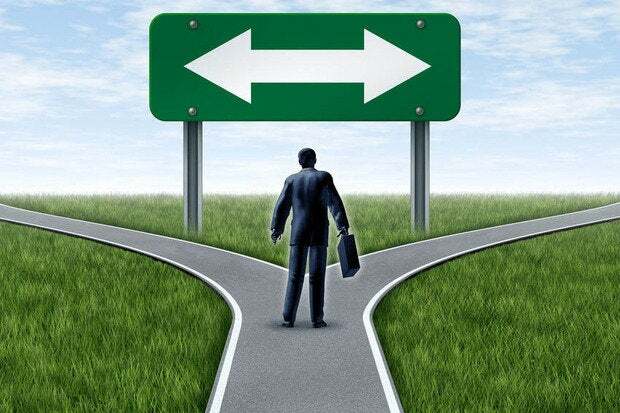 While this is great news, these IT leaders are struggling with how to make the best decision: Which job offer should they take? Should they stay at their current company? What if their current company makes a counter-offer? "You’re making a career decision here!" This classic line is from the movie Trading Places where Louis Winthorpe challenges a police officer who is about to conduct a body search. And this same line is appropriate when you are considering a job offer. The choice you make today may pay off big time, or it could potentially derail your career. The reason why it’s hard for many people to make the best decision is because they’re not considering all the critical reasons to accept or pass on the job offer. We’ve been trained to look at the obvious: salary, bonus, vacation time, health benefits and other perks. We also try to determine if we are compatible with the culture and whether we will like our hiring manager. While these are great things to consider, there are other criteria that you must evaluate to make the best decision possible. After all, you could be making a lot more money, but it could be at the cost of working 60 hours a week. Making the best decision doesn’t have to so stressful. It’s really a combination of using your head and your heart to make your choice. Use your head – you need to evaluate more data points than salary, bonus, and the other obvious criteria. It means going a bit broader and deeper, and answering those questions that will help you get clear about this new opportunity. Use your heart – this is the “gut check” you’ll want to do after having weighed all aspects of the offer. Considering everything you’ve learned about the offer, does it “feel right” to you? Too many times we IT people stay in our heads and never connect with our hearts when making decisions. So I encourage you to listen to your gut and don’t discount what you’re feeling. I recently coached a client who had a dream job offer. All the right pieces seem to be there. But as I coached her through making the decision, when she listened to her heart, she felt uneasy about accepting this job. After more exploration, she realized the job wasn’t really a good fit for her, and that she was considering accepting the offer out of fear of scarcity, rather than from a position of strength. Where will you contribute the most value? Will this new job provide more opportunities for you to make a difference? Where will you be most valued? Will others be more appreciative of your talents and contributions? How does the opportunity line up with your career aspirations? Does it provide opportunities to advance to the next level? How does this job fit with your personal life? What about the commute? Will you have flexibility to attend the kids’ special events? Work/life balance – is this job going to be a grind where you’re going to burn out fast? Or does it provide a sense of overall balance, even though you may have to put in extra hours from time to time? Socially responsibility – if social consciousness means a lot to you then this may be part of your consideration. Perhaps the company sells a product that you feel is harmful or doesn’t line up with your personal values. 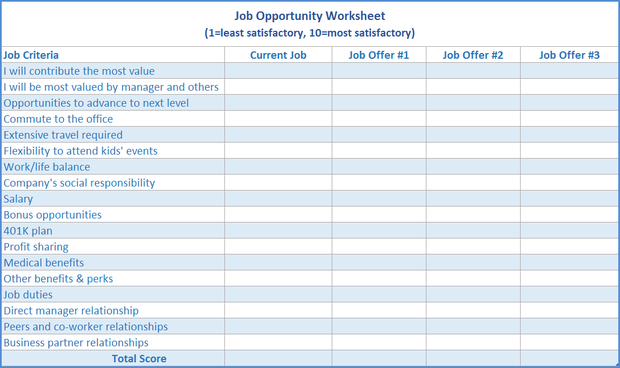 Create a spreadsheet giving weight to the various aspects of your current job and the offers(s) on the table using the standard questions mentioned earlier, plus those I’ve provided above. Here's a sample just to give you an idea. After going through your scoring exercise and looking at how things stack up, be sure to check in with your heart. If your head and your heart seem to be in alignment with your decision, then rest easy. You’ve made the best decision based on the information you have available. Do you have additional criteria for evaluating a job offer beyond the obvious questions? Please share it with us!